Fabulous deed restricted waterfront boating community just 3 miles to Anna Maria Island beaches. Boaters have access to the intracoastal with their choice of fresh or salt water canals. 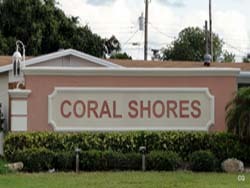 Residents love the location and natural setting Coral Shores has to offer. Low maintenance fees and affordable waterfront boating lifestyle. You may also like San Remo, Flamimgo Cay, Key Royale or Country Club Shores Communities.